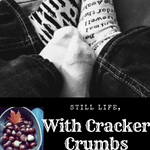 day in the life | Still Life, With Cracker Crumbs..
A Belated Hello to March! I never really used to like March. I wasn’t much a springtime gal – I equated it with being overdressed for the weather, somehow. Like it is not warm enough to not wear a coat, but too warm to wear your coat in a car. LOL. I know so crazy right? And I am a fall-winter lover. But now..I look forward to the spring! March is the month of the full worm moon, which sounds bizarre, until you know why it is called that. In March, the month where we welcome springtime back to us, everything starts to awaken, become re-energized, even the little worms down there in the dirt. They start wriggling toward the surface as the earth softens, ready to start our new growing cycle. The gentle ease of winter is over, when we enjoy our long nights and cozy rooms, and in rushes spring, with all the energy of those bunnies that hop around our yards. I can feel that life returning, can you? March is also the month my Wyatt was born. And he is such a joy – everyone who meets him talks about how it is impossible to be in a bad mood around him. He is truly my sunshine boy, with his giggles and huge smiles and hugs. He is spring, liveliness and happiness, with just a bit of a temper, much like a spring shower. Spring is coming, with the spring equinox right around the corner. I have different foods on our menu, as we turn away from comfort foods like thick and creamy soups and pasta, and crave the freshness of the food that will be growing before we know it. I bought seeds to start, and bird houses for birds to nest in, hopefully. I bought one of those hanging nesting boxes that attaches to your window – I would love to see a family move in. We will be clearing out our garden beds, preparing for our seedlings that we will plant next month. I have peas and flowers and peanuts and cucumbers, all of our favorites, and then the seeds that go directly into the earth, like our carrots and Indian Paintbrush. I am looking forward to walks with more sun and warmth, less biting winds and stomping through snow, although we like that too. And we are planning on going to a maple sugaring event next weekend, since the sap is rising in the trees, as they sense the coming of spring as well. I am also going to give my house a good spring cleaning, and pack away our heavier blankets and signs of winter. I am looking forward to this spring, and all the new things that it will bring. How about you? Any new plans or ideas in the works?